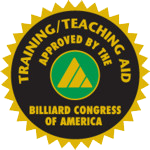 The Billiard Aim Trainer (BAT)™, the world’s first pool trainer that teaches the superior three-cut system of billiards has been improved! The new version (Mark II) is more accurate, stronger and easier to use. The BAT ™ sits on the pool table and uses a combination of references to show the player the exact cue ball path for targeting; the degree of the angle; the contact point, and exactly how much of the object ball needs to be cut. The patented invention requires no batteries or technical skill to teach the key concepts of pocketing balls. 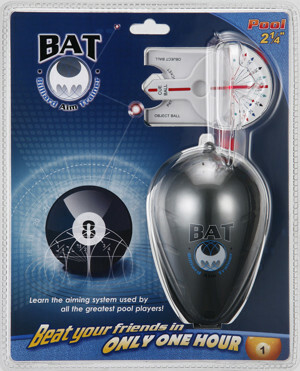 Any person, of any skill level, can quickly become a better pool player within minutes of using the BAT™. Typically, more proficient players will intuitively know how to cut the ball, however, for those just starting out or wanting to speed up their development, the BAT perfectly demystifies the whole science of cutting angles. Australian-born Paul Rodney Turner invented the Billiard Aim Trainer (BAT) in 2004 while contemplating a method to teach his billiard students how to understand and apply the three-cut aiming system he learned as a boy while practicing snooker. 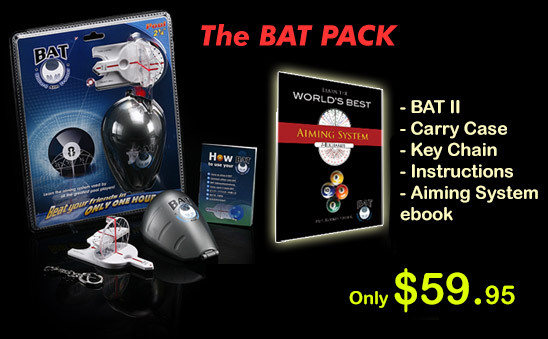 The BAT is considered by many professional billiards trainers to be the best aim trainer in the world. The BAT ™ is currently being distributed by Dershr. ORDER NOW from DERSHR $59.95!